The best Week 12 matchups for running backs actually feature some running backs that you may have considered benching, or you may even find them on the waiver wire. For some of these players, this could be the last week of fantasy relevance if they don't perform. However based on their matchups, they could reward those fantasy owners who choose to gamble. Here are some running backs to target in Week 12. Kareem Hunt has been a disappointment the last few weeks, failing to return to his early season form of gaining at least 100 total yards per game. He also hasn't scored since Week 3. In Week 11, Hunt rushed 18 times for 73 yards and caught 3 passes for 4 yards. The usage was a nice sign after only carrying the ball 9 times in Week 10. The no touchdown streak should end in Week 12 against the 31st ranked Bills' defense in points allowed to RBs. Teams have been shredding the Bills, including a 5 touchdown performance by the Saints a few weeks ago. People have been discussing whether or not to bench Hunt, but give it at least one more week for Andy Reid to get it together and stop trying to be cute. His team has dropped 4 out of the last 5. Alf Morris ran well against a tough Philadelphia defensive line in Week 11, gaining 91 yards on 17 attempts. 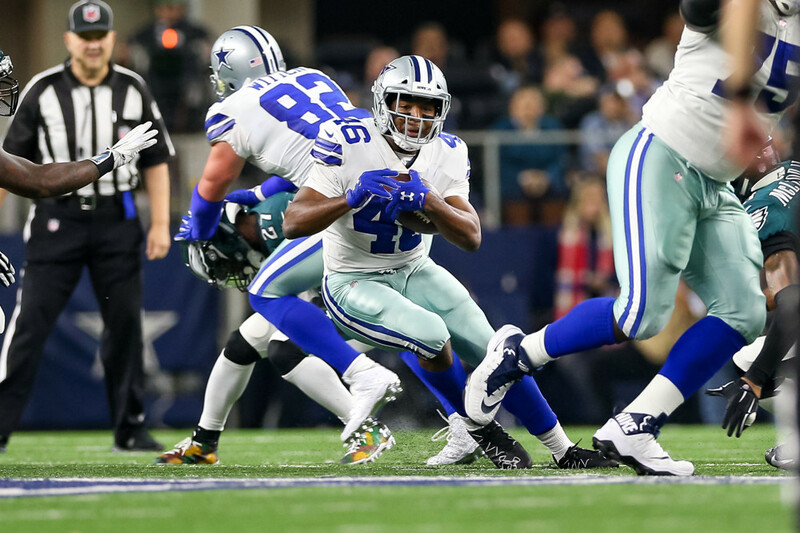 Morris was running well, gaining big chunks of yards even though the Cowboys were playing from behind most of the game. In Week 12, the Cowboys take on the Los Angeles Chargers, who currently rank 30th in points allowed to RBs. The Cowboys may get probowl LT Tyron Smith back, which would be a huge benefit to the offense. The Chargers have had a solid passing defense, so the Cowboys may look to control the clock in order to pull off a win. Orleans Darkwa has been quietly solid as the New York Giants' running back. He has gained at least 70 yards in the past three games, as well as catching at least 2 passes. In Week 11 against the Chiefs, Darkwa carried the ball 20 times for 74 yards and 1 touchdown. His 2 receptions went for 16 yards. In Week 12, the Giants travel to Washington for a division matchup against the 25th ranked defense in points allowed to RBs. The Redskins are reeling after losing even more players to injury. Darkwa might not be the flashiest running back, but at this rate he has a solid floor if you need a safe play. Damien Williams rushed 10 times for 78 yards and caught 1 pass for 24 yards in Week 11's loss to the Buccaneers. We have yet to really see the RB duo of Williams and Kenyan Drake with QB Matt Moore, but a Cutler concussion may give us that opportunity in Week 12 against the New England Patriots. Williams is known as the pass catching RB in Miami, and he should see plenty of targets against the 24th ranked defense in points allowed to RBs. It's pretty well known that the Patriots aren't the best at defending pass catching RBs. Add in that the Dolphins will probably be playing catch up, and Williams becomes a solid flex option. This pick is more of a speculation. Let's face it, CJ Anderson stinks this year. Last week wasn't much better. Anderson rushed 13 times for 37 yards and 1 touchdown in Week 11's loss to the Bengals. He also caught 2 passes for 19 yards. Denver's offense has been atrocious this year, to the point where they now have fired their OC. This might actually be good news for Anderson, as the previous OC was using 3 RBs. We will just have to see what the new OC does this week against the Oakland Raiders, who currently rank 29th in points allowed to RBs. This may be Anderson's final attempt to hold the starting job in Denver, but he has a great matchup to prove he should be the starter.